The holidays can definitely be a hectic time of year, but it's also a time when the kids have more time off school. When you need a quick winter boredom buster, nothing is better than using recycled materials from around the house to whip up a holiday craft to keep the kids entertained. Pipe cleaners, construction paper, googly eyes and ribbon are a few of the craft staples that I always have on hand. Recently, I've added another item to my craft stash: empty toilet paper tubes and other paper tubes from paper towels, tin foil, etc. 1) These toilet roll Snowman Ornaments are so precious! I'm definitely going to make these with my kids. 2) I think these simple Reindeer ornaments are perfect for preschoolers. 3) Kids will love tearing apart these traditional Christmas Crackers just as much as they'll enjoy making them! 4) Here's how to make a simple model Christmas Village and cotton ball snowman. 5) You can also try this recycled Nativity Scene and baby to go with your Christmas village. 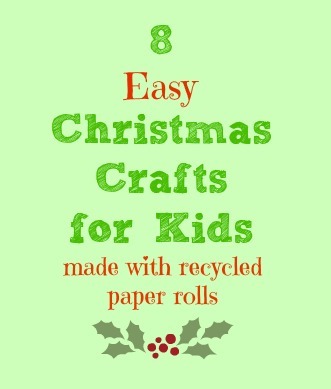 6) I love this Santa's bushy beard in this paper roll Santa Craft. Try these out and let me know what you think!